Virginia Gov. Ralph Northam, centre, with Lt. Gov. 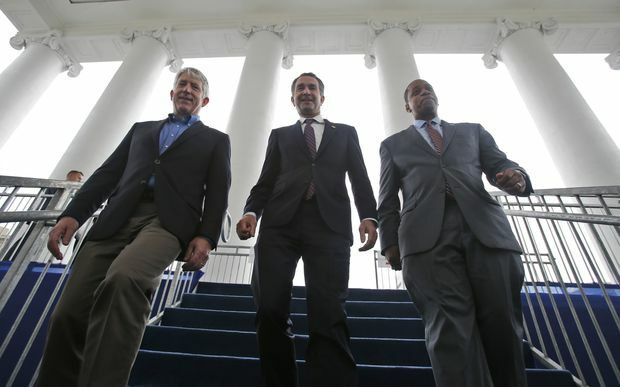 Justin Fairfax, right, and Attorney General Mark Herring in 2018. All three men are embroiled in controversy. Virginia lawmakers on Monday will reluctantly face the unprecedented prospect of impeaching the state’s second most powerful leader as they struggle to address revelations of past racist behaviour and allegations of sexual assault roiling its highest levels of office. Some political observers said it’s possible impeachment would move forward in the House of Delegates – even if the threshold to start the process is remarkably high. However, lawmakers are set to leave town before February ends and may lack the time and resources to immediately take on the complicated issue. “A clear sign of the depth of LG Fairfax’s political crisis is the near-absence of voices in Virginia politics this weekend publicly urging him to remain in office,” University of Mary Washington political science professor Stephen Farnsworth said in an e-mail.